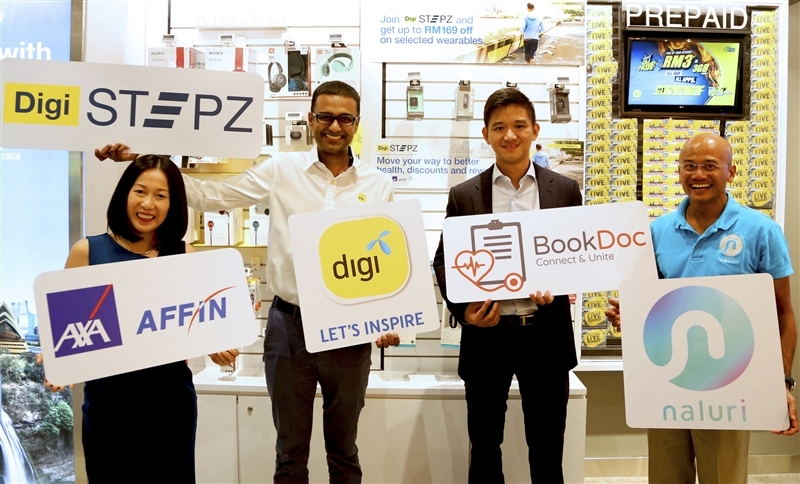 Digi Telecommunications Sdn Bhd (Digi) announced today the launch of Digi Stepz, a wellness pilot programme that allows Malaysians to stay fit by measuring their average daily steps through fitness wearables and be rewarded for staying active. L-R: AXA AFFIN Life’s Chief Customer Experience Officer (CCXO) GG Kam, Digi Chief Digital Officer Praveen Rajan, BookDoc Founder and Chief Executive Officer, Dato Chevy Beh and Naluri Founder and Chief Executive Officer, Azran Osman-Rani. The programme, in partnership AXA AFFIN Life, BookDoc and Naluri, is open to all Malaysians between the ages of 18 and 39. Digi Stepz runs for a month-long period beginning from 3 November until 2 December 2018 at all participating Digi Stores in Klang Valley. AXA AFFIN Life is an insurance provider while BookDoc is an online platform that connect patients to healthcare professionals. Naluri offers personalized health program and a digital app that connects users to health and clinical psychologists. As part of the Digi Stepz programme, participants need to accumulate daily steps by doing their favourite fitness activities to enjoy rewards from over 60 merchants from BookDoc and up to 12% cash back on their first year annual premium with AXA eMedic. The merchant and insurance rewards are tiered based on Bronze, Silver and Gold categories. In the Bronze category, participants who walk, for example a minimum of 3,000 average daily steps per month are entitled for merchant rewards only. In the Silver and Gold categories, participants who walk a minimum of 6,000 and 10,000 average daily steps per month are entitled for 6% and 12% cash back on their AXA eMedic plans respectively. In both categories, participants are also entitled to merchant rewards. To join Digi Stepz, participants need to purchase AXA eMedic which starts from RM32 a month. Participants also need to purchase fitness watches by Fitbit or Garmin, which is priced from RM569 (after discount) from participating Digi Stores in Klang Valley. Upon signing-up, participants will also receive free Digital Health Coach Programme from Naluri Hidup for two weeks. “As Malaysia’s largest network with 11.8 million subscribers or one-third of the population we have a social responsibility to Malaysians including our customers in connecting them to what matters most – their health. And, the unique thing about Digi Stepz is that we offer attractive rewards to raise the level of interest in health and fitness among Malaysians,” explained Digi’s Chief Digital Officer, Praveen Rajan. BookDoc Founder and Chief Executive Officer Dato Chevy Beh said, “We are honoured to be able to play an important role to help improve the well-being for all Malaysians. Malaysia has the highest obesity rate in Southeast Asia and we want to help reverse this trend. Furthermore, NCDs is a preventable one. So why wait when we can take a more proactive approach? BookDoc offers a complete fitness solution to Malaysians. Participants will be rewarded for staying active and when unwell, BookDoc allows them to search and book healthcare professionals, anytime, anywhere,”. For more information on Digi Stepz, please visit the Digi website.